Sneak peak for the updates...(actually, it occurs that the site is now updated as it is now Thursday by its clock. O well...guess the update is up!). I was making the baby socks a couple months ago with the idea of hanging a bunch of them along my shelf. Four pairs in all. 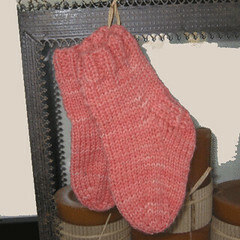 It never happened, and I got tired of knitting baby socks- for the time being anyways. Cleverly, I had made them in pairs. Since the update is here...you can see them here.